Standing before the EU parliament in Brussels on May 16 2001, French EU parliamentarian Paul Marie Couteax made a stunning statement. After condemning Israel's actions to defend itself against Palestinian terrorism as the "theocratic excesses of this religious state," Couteax declared that Europe should supply the Arab world with nuclear weapons. As he put it, "I have no hesitation in saying that we must consider giving the Arab side a large enough force, including a large enough nuclear force, to persuade Israel that it cannot simply do whatever it wants. That is the policy my country [France] pursued in the 1970s when it gave Iraq a nuclear force." Couteax's statement, though over the top, follows a flow of seemingly obtuse and illogical statements and actions by the EU and its member states since the start of the Palestinian terror war almost four years ago. For instance, in the midst of the IDF's counter-terror operations in Rafah last week, Ireland's Foreign Minister Brian Cowan, speaking for the EU whose presidency his country currently holds, condemned Israel's actions in the most hysterical and factually inaccurate terms. After meeting a delegation from the Organization of the Islamic Conference (the same people who gave a standing ovation to Malaysia's then prime minister Mahathir Mohamad last fall when he claimed that Jews were the source of all the troubles in the world), Cowan all but accused Israel of carrying out war crimes when he stated that "Israeli forces showed a reckless disregard for human life." Placing the IDF's military operations directed against Palestinian terrorists on par with the murder of Tali Hatuel and her four young daughters in a deliberate attack by Palestinian terrorists, Cowan said, "I would once again remind Israel, the occupying power, that the Fourth Geneva Convention relative to the Protection of Civilian Persons in Time of War is fully applicable to the Gaza Strip." Like almost all of the EU's statements, Cowan's remarks ignore basic facts. As a database compiled by the International Policy Institute for Counter Terrorism shows quite clearly, Israel targets terrorists in its operations while Palestinians attack Israelis indiscriminately. The institute's figures show conclusively that since the start of the Palestinian terror war, non-combatants have made up 80 percent of Israeli casualties, whereas on the Palestinian side, 56% of casualties have been verified combatants. Since Palestinian terrorists generally do not wear uniforms, Dan Radlauer – who oversees the database – explains that it is quite possible that the percentage of Palestinian casualties who are combatants may actually be significantly higher than that figure. This information is readily available to Cowan and his EU colleagues. They could easily have put together a similar study. But that would not advance their interests. In a revealing incident, earlier this month, the Palestinian Human Rights Monitoring Group (PHRMG) released a report outlining the systemic abuse of power by Palestinian security forces against Palestinian civilians. According to an account in The Scotsman, the report has not won PHRMG accolades for its brave and honest reporting in an atmosphere of terror and repression cultivated by Arafat and his henchmen. Rather, in response to the organization's decision to document human rights abuses by the PA and by Israel, the group has seen its financial support from the EU slashed. If one believes the EU's rhetoric of support for the peaceful resolution of the Arab-Israeli conflict, the EU's actions make no sense. After all, if the EU is interested in an end to the terror war, it should be empowering anti-terror groups in the PA to uncover abuses and fight them. Yet rather than do so, the EU has shelved every report that has proven that EU funds to the PA are actually diverted to finance terrorism and incitement. If the EU wishes to play an active role in the search for peace and security in the region, it should not be condemning lawful Israeli actions against terrorists and ignoring the fact that, by its indiscriminate nature, Palestinian terrorism is an affront to the very notion of international law. Yet, this is precisely the point. There is a yawning gap between the EU's rhetoric and its actual policies. Its rhetoric purports to work toward a workable peace between Israel and its neighbors. Its actual policy is to support the Arabs against Israel. Indeed, Europe has a three-tiered approach to the Arab world, each policy layer of which is inherently inimical to the notion of fairness and balance in relation to Israel. Since the 1970s, Europe has embraced appeasement of the Arabs as a central plank of its foreign policy. This became entrenched in the wake of the 1973 OPEC oil embargo. As well, following the trail blazed by Charles de Gaulle, sympathy to the Arabs and hostility towards Israel have served Europe's interest in differentiating itself from the US. Because the US is committed to European security through the NATO alliance, Europe can curry favor with the Arabs from whom the US will protect it. 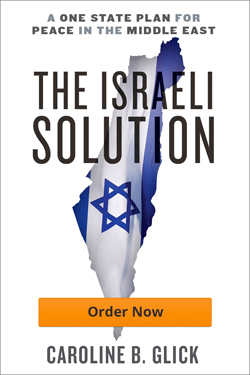 At the same time, it can deflect Arab wrath onto the US, which is unwilling – for strategic and moral reasons – to sever its alliance with Israel. Finally, Europe has a domestic interest in currying the favor of the Arabs over Israel. Europe has a growing Muslim population that has been inculcated with a fanatical form of anti-Semitism. Anti-Semitism is also rife on both the left and right sides of the European political spectrum. Given this, it is good politics domestically to condemn Israel, while turning a blind eye to Arab terrorism and human rights abuses. So what we have in Europe, then, is not an otherwise friendly continent that condemns Israel out of sheer ignorance. Rather, we have a hostile continent that condemns Israel to advance its perceived political and strategic interests. While hostility towards Israel is comprehensible when it comes from a militarily weak and self-interested Europe, such refusal to acknowledge the reality of the nature of the Palestinian war against Israel makes less sense in the American context. The US cannot depend on a security guarantee from any foreign power. It must defend itself and its global interests. From this distinction, it necessarily transpires that US national security interests cannot be long advanced by appeasement of terror-supporting regimes in the Arab and Muslim world which declare the US to be the primary source of evil in the world. Yet since last spring, we have seen concerted American moves toward embracing Europe's hostile positions towards Israel. The latest example was the American refusal to cast a veto on last week's UN Security Council's condemnation of the IDF operations in Rafah. This move must be seen in the context of an overall US policy of giving the EU and the UN a larger role in the formulation of America's policy towards Israel. This trend was instigated by Washington's decision last year to work with the UN, the EU and Russia in formulating and launching the road-map plan for peace. It isn't that all Europeans are inherently hostile towards Israel. In an amazing display of pride and wisdom two weeks ago, French Jews boycotted a rally against anti-Semitism. The boycott came not because the Jews of France do not view anti-Semitism as a salient threat. On the contrary, they boycotted the rally because its organizers refused to link anti-Semitic attacks in the country to anti-Zionism. Given the direct link between anti-Semitism and hostility towards the Jewish state in Europe, it is important to question what Israel has been doing to diminish Europe's perceived interest in appeasing the Arab world. Looking at the government's policy towards Europe over the past few years, the answer is that it has done nothing effective to change European perceptions. Last summer, for instance, Foreign Minister Silvan Shalom expressed an interest in applying for membership in the EU. When the EU condemns Israel, as it did last week, Israel may express revulsion. Yet, it continues to call for Europe to play an active role in the search for peace. In so doing, Israel maintains a fiction of European friendship and fair-mindedness in the pursuit of its Middle East agenda that simply do not exist. Were Israel to treat Europe as the hostile force it is, it could craft a workable policy. This should be aimed at strengthening the voices in Europe calling for an abandonment of anti-Semitism and a reckoning with the actual threat that the increasingly radicalized Islamic world manifests to its own security. As it stands, the current policy of sweeping European hostility under the rug of diplo-speak cocktail parties and press conferences is detracting from Israel's national security interests. The government's policy of denial is legitimizing hateful voices and blocking voices of reason from being heard above the din of anti-Zionist propaganda. At the same time, Israeli tolerance for European hostility strengthens the forces of appeasement in the US and weakens those allies who understand the strategic necessity of supporting Israel.